View is to the northwest along cobble-rich debris flow near Spring Lake. The High Line canal, which was partly filled with debris, extends across the middle of the photo. 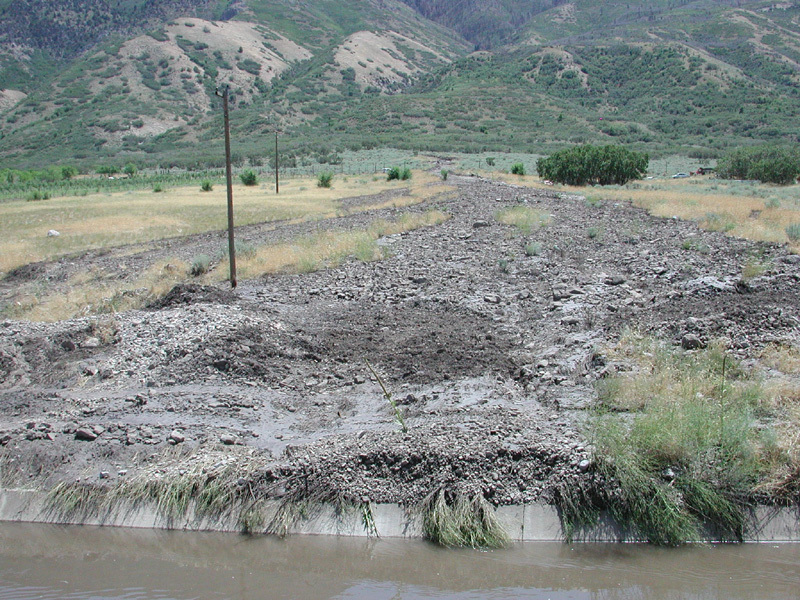 Intense rainfall in the afternoon and evening of July 26th, 2004, triggered two fire-related debris flows south of Provo, near Spring Lake and Santaquin, Utah. 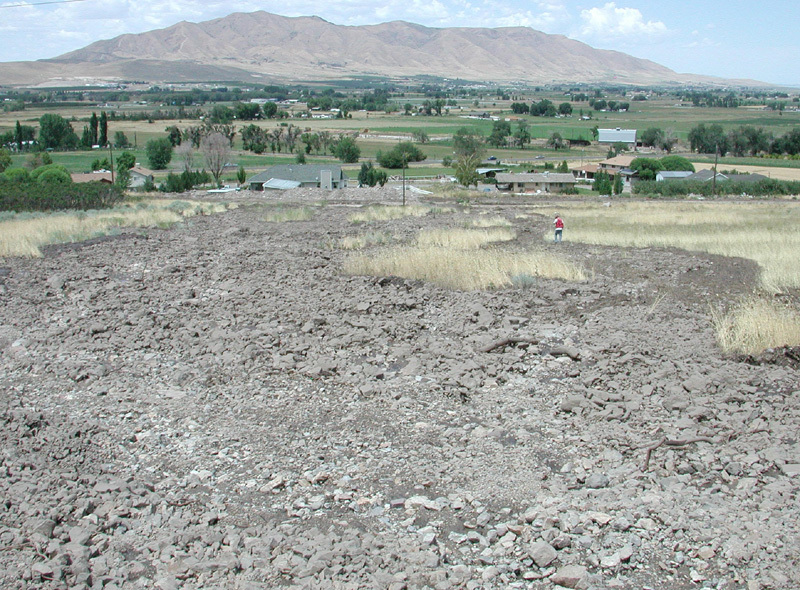 Mud-, cobble-, and boulder-rich sediment discharged from two drainages on the northwest flank of Dry Mountain, and was deposited on alluvial fans north of the range-front. 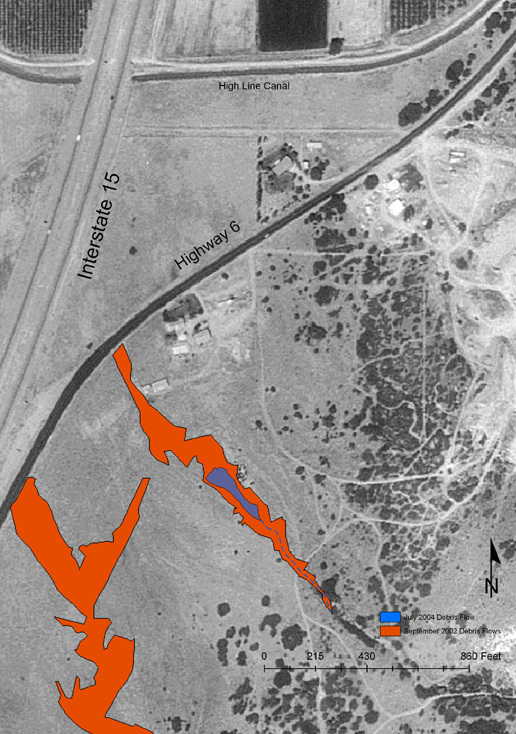 The debris originated from drainage areas burned by the human-caused 8,000-acre Mollie wildfire of 2001. The fire-related debris flows were in the same general location as the two northernmost flows of September 12th, 2002; however, the July 2004 flows were smaller and did not travel as far north as the 2002 flows (see maps below). No damage to residential homes or property was reported. 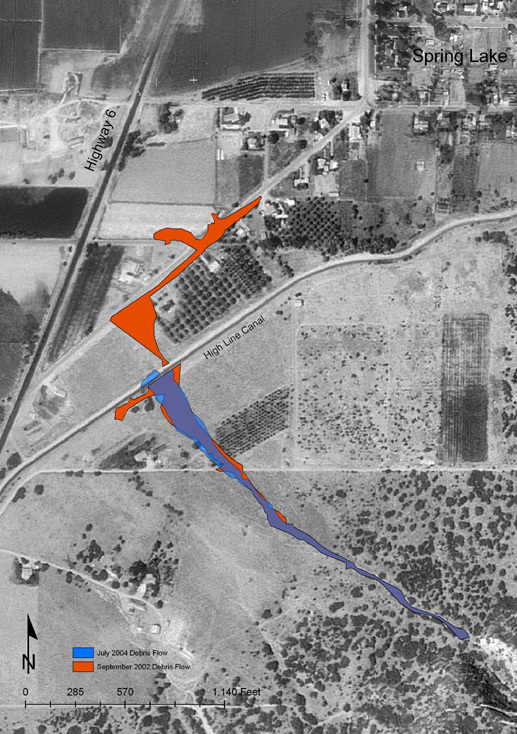 Conversely, the September 2002 flows resulted in significant damage to a subdivision due to a large volume of debris that originated from a drainage farther to the south. No debris flows were generated from that drainage in the July 2004 storm. 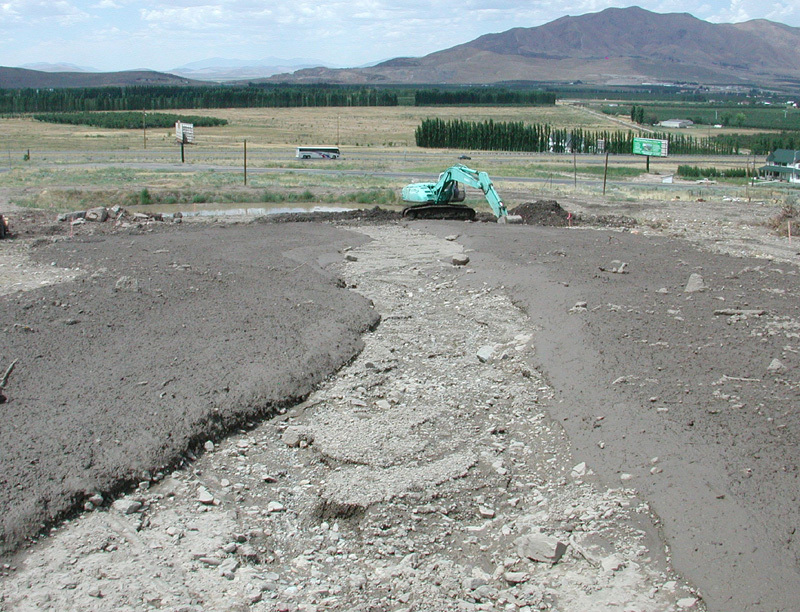 The larger debris flow is located southwest of Spring Lake and traveled to the northwest, filling part of the High Line irrigation canal with cobbles and silt. The debris was quickly excavated to prevent overflow and flooding of the canal. 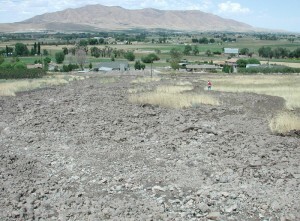 The thickness of new material in the 2004 deposit could not be determined as an unknown amount of the September 2002 debris was incorporated into the flow. 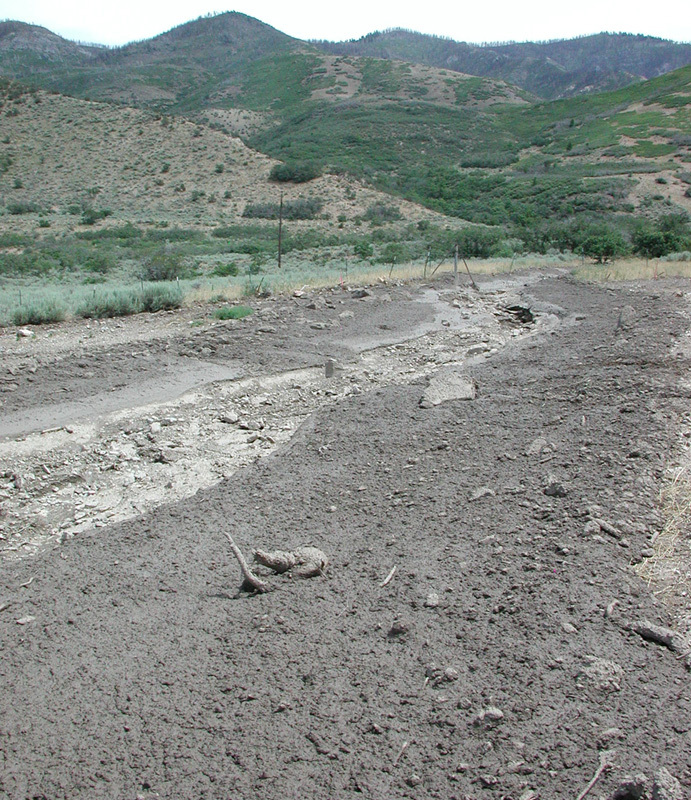 About a mile east of Santaquin, a smaller debris flow traveled to the northwest into a storm-water catchment basin. The deposit is approximately 9 to 12 inches thick.